'Spider-Man/Deadpool Vol. 5: Arms Race' review: Can't we all just get along? – AiPT! 'Spider-Man/Deadpool Vol. 5: Arms Race' review: Can't we all just get along? ‘Spider-Man/Deadpool Vol. 5: Arms Race’ review: Can’t we all just get along? Does Spider-Man no longer ❤️ Deadpool? There have been cases where reading a series in the single issue format becomes impossible. You run out of time, a chapter doesn’t sell you completely, or you just want to save some coin. That happened to me with the latest arc “Arms Race” in Spider-Man/Deadpool, but thankfully, today in comic stores, I can catch up. Arcade’s MURDERWORLD expansion operation continues, and Spider-Man’s the first guest at his second, deadlier theme park! It’s up to Deadpool to save Spidey from Arcade’s clutches, but the question remains…will he want to? Collecting Spider-Man/Deadpool #23 to #28, this arc builds upon the growing power of the Chameleon and the continued unrest for the friendship of our titular heroes. Robbie Thompson writes good dialogue for both loudmouth characters and Chris Bachalo, Scott Hepburn, Marcus To and Matt Horak do well to draw the strange creatures and monsters that pop up in this book. Call it a sci-fi comedy if you will — it’s good for a laugh. There are a lot of monsters in this one. 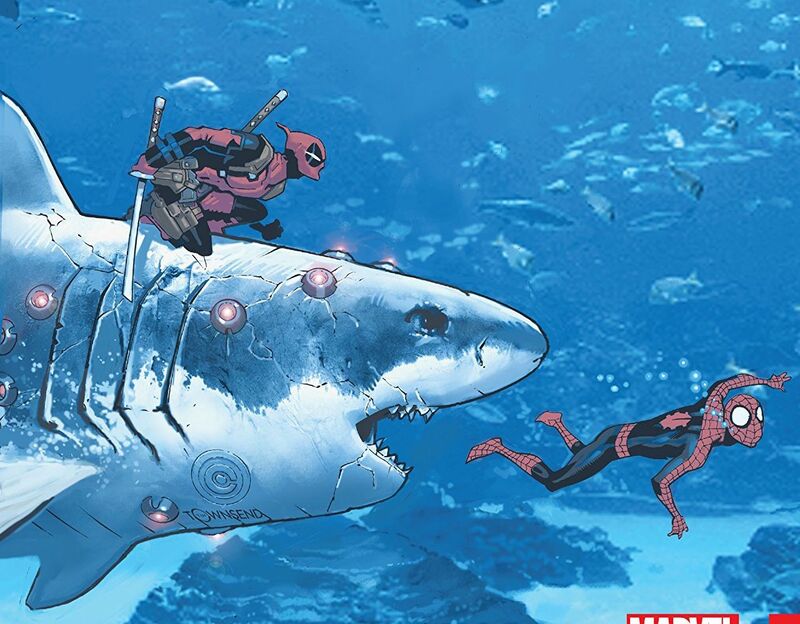 Taken as a whole, Thompson does a good job pushing the relationship between Deadpool and Spider-Man to a new low. Basically Spidey never really admits they’re friends, but now he wants to bring Deadpool in for his crimes. Deadpool is hurt by this and through the arc you get a satisfying development, from disbelief to eventually complete dismay. It gives the characters a bit of validity as they punch each other, save each other, and attempt to make nice. The Chameleon story is a nice touch, bringing back an old character and slowly building up his plan before our eyes. It’s a bit of a spoiler to even say he’s in the book, but he’s plastered on the back so don’t shoot the messenger! Thompson gives this villain’s exploits a bit of purpose as he’s really only getting away with these things because our heroes are distracted with fighting each other. Isn’t that always the case? This collection also harbors two fun one-shot style stories, one dealing with our characters in the future (they’re living in an old folks home, the poor suckers) and the other telling a he-said-she-said tale. I already gushed over the latter issue here, but it’s a nice spark to the story and serves as an entertaining aside. It also builds up their continued fight with each other. The art by the creative team is excellent with plenty of monsters and weird things to draw throughout the series. Deadpool’s team that resides on his own Helicarrier are an eclectic bunch that are kooky enough to push Deadpool or run with this insane plans. 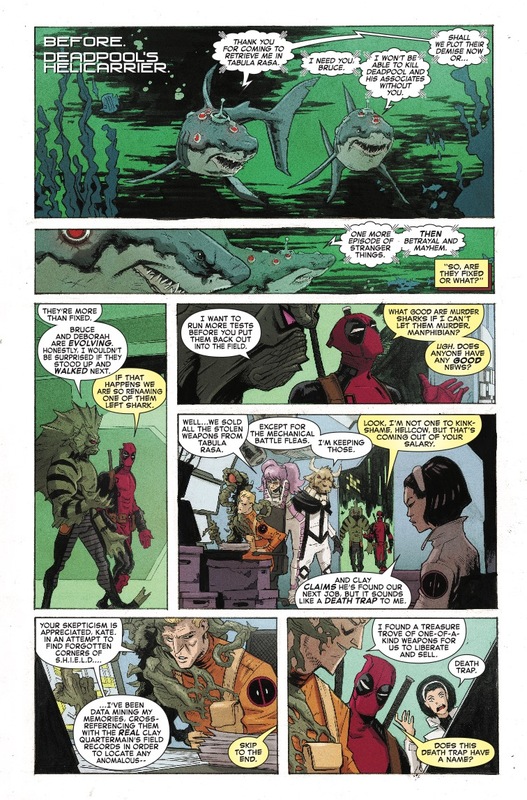 Their designs are quite cool, Bachalo is one of the best at drawing organic creatures (only he could pull off making two talking sharks likable), and it gives the book an otherworldly feel. A major highlight of the collection. This collection can feel too chaotic for its own good, from the art to the plotting of each chapter. The inclusion of the old version characters seems a tad out of place and most likely will be collected later in its own trade. It disrupts the flow of the story and makes the next chapter in that flow somewhat confusing. Thompson has to do some backtracking to remind us what Deadpool’s crew is all about which seems a bit aimless when you consider how much they steal. How much money do these guys need? Overall this is a good collection that plays to the ever-changing relationship of the most talkative superheroes in existence. It also slowly builds up an impending threat that, most likely, will bring these two heroes back together in friendship love forever. Balances its character stories well with some zany plots and crazy twists. Monster madness! Come for all the creatures.